Bracebridge Heath marched on at the top of the Readers Lincolnshire ECB Premier League with a fourth maximum point win in succession, this time over Sleaford. Behind them, Grantham lead Woodhall Spa by one point, with Lindum, Grimsby Town and Bourne making up the top six. At the bottom of the table, Spalding and Market Deeping are still looking for their first victory. 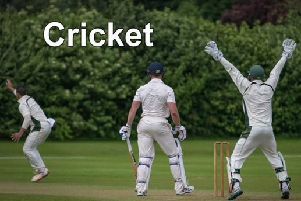 Alex Willerton’s five wickets for Bracebridge helped bowl Sleaford all out for 158 and David Whapplington made any unbeaten 89 to take his side to a seven wicket win. Grantham had a much tighter game after batting first at Boston. Dan Freeman made 53, James Keast 58 and Mat Dowman 57 as the visitors finished 227 for six. Jonny Cheer then held the Boston innings together after the first two wickets had fallen for 22 runs. Cheer (77) and Tom Baxter put on 50 for the fifth wicket and going into the last over with nine down, it looked as if Grantham would be denied maximum points but Freeman stepped up to make the final dismissal with one ball of the game to go. After their recent league and cup successes, Alford were brought back down to earth by a strong Woodhall Spa side but picked up six valuable points as they bowled their visitors out for 226, Pradeep Chanditha making 50. Alford got off to a good start with an opening stand of 54 but by the time Rikki Bovey was out for 56, six wickets were down and the final one fell on 143, Jack Timby taking four catches and one stumping behind the sticks for Woodhall. Lindum climbed up to fourth in the table with a comprehensive win at Spalding. From 63 for four, Will Taylor and Euan Pickering added 88, Taylor making 54 and the lower order helped Lindum to 216 for seven at the close. Spalding also got off to a steady start but from 37-0 were reduced to 49 for five, Joe Peatman taking three of the wickets. A middle order revival took the score to 91 when the seventh wicket fell but only four more runs were added before Spalding slipped to defeat. Grimsby celebrated their third win of the season, restricting Louth to 149 for nine at Augusta Street, of which Richard Bell hit 61. The home side then knocked off the runs for the loss of six wickets. At Abbey Lawn, Bourne lost their first wicket to Market Deeping with only one run scored but went on to make the day&#39;s highest total in a match that saw five half centuries. Jack Berry made 60, Sam Evison 51, Carl Wilson 83 and Quewin O&#39;Connor an unbeaten 55 to take Bourne to 279 for six. Deeping got off to a better start but from 93 for two slumped to 118 for six before being all out for 185, David Sargeant hitting 89. Results: Sleaford 158 (Willerton 5-40), Bracebridge Heath 162-3 (Whapplington 89no); Grantham 227-6 (Freeman 53, Keast 58, Dowman 57), Boston 202 (Cheer 77); Bourne 279-6 (Berry 60, Evison 51, Wilson 83, O&#39;Connor 55no), Market Deeping 185 (Sargeant 79); Lindum 216-7 (Taylor 54), Spalding 95; Woodhall Spa 226 (Chanditha 60), Alford 143 (Bovey 56, Timby 5 wicketkeeping dismissals); Louth 149-9 (Bell 61), Grimsby 153-6.